In this book chapter excerpt, learn how SAP ERP users can improve their warehouse operation strategy through inbound delivery. manufacturing process. In this SAP Press book chapter excerpt, learn how SAP ERP users can improve their warehouse operation strategy by making inbound delivery strategies more streamlined. The receiving of materials into a facility should be an efficient process that is accurate, streamlined, and rapid. When performed correctly, the receiving process should produce an effective use of your warehouse space and resources. This excerpt from Maximize Your Warehouse Operations with SAP ER P by Martin Murray is reprinted here with permission from SAP Press, copyright 2011. Download a PDF of this chapter. The goods receipt process is the movement of materials into the warehouse from an external source, which could be a vendor, or from the production facility. A receipt process checks the accuracy of both the materials and the quantity. You can check the materials for quality and quarantine if needed. If the quality is satisfactory, the process moves the materials into the warehouse and increases the stock levels of the materials received. The goods receipt is an important point in the movement of materials. Accepting the items triggers the ownership and financial liability. The receipt of the materials is also the starting point of the tracking of those materials in the facility. Several processes can trigger inbound deliveries. In the first section of this chapter, we’ll review these with respect to the inbound delivery functionality. The inbound delivery should describe exactly what materials can be received on what date and at what time. The advantages of the inbound delivery function when receiving materials into the warehouse are that you can complete several processes in advance of the materials arriving because the supplier has sent the necessary information to the plant ahead of time using an advanced shipping notice, commonly known as an ASN. First, let’s look at the elements that make up the inbound delivery process. The inbound delivery process starts when the items are staged at the vendor for pickup by the shipper. The items are made ready for shipment by placing them on a pallet or shipping container at the vendor’s shipping area. The items are loaded on to the shipper’s vehicle and transported to the ship-to location. The process is completed when the items are received at the ship-to party and a goods receipt transaction is processed. We’ll highlight the elements of the inbound delivery process below. When you require items for production or resale, you purchase them from a vendor. If you have a scheduling agreement in place with a vendor, deliveries will occur at regular intervals. If no scheduling agreement exists, you can create a purchase order using Transaction ME21N . You can access the transaction via the menu path SAP • Logistics • Materials Management • Purchasing • Purchase Order • Create • Vendor/ Supplying Plant Known. Figure 2.1 shows an example of a purchase order for five drill presses that have been ordered from Dremel Industries to be delivered on October 22, 2009. You determine the goods receiving point based on a configuration that has been entered in the IMG. For an inbound delivery , you assign the goods receiving point based on the receiving plant and storage location that was entered into the purchase order. You can find the configuration using the menu path IMG • Logistics Execution • Shipping • Basic Shipping Functions • Shipping Point and Goods Receiving Point Determination • Assign Goods Receiving Points for Inbound Deliveries. Figure 2.2 shows the configuration that allows you to determine a goods receiving point based on the receiving plant and storage location. For Plant 1000 and Storage Location 1000, Shipping Point 0034 is assigned as the goods receiving point. The inbound delivery can be created either manually or automatically if your vendor sends an advanced shipping notice via electronic data interchange (EDI) . 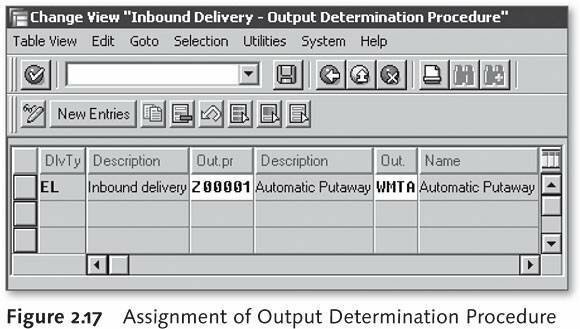 In this section, we’ll look at the manual creation of an inbound delivery for a purchase order. You can create a manual inbound delivery using Transaction VL31N or by going to SAP • Logistics • Logistics Execution • Inbound Process • Goods Receipt for Inbound Delivery • Inbound Delivery • Create Single Documents. 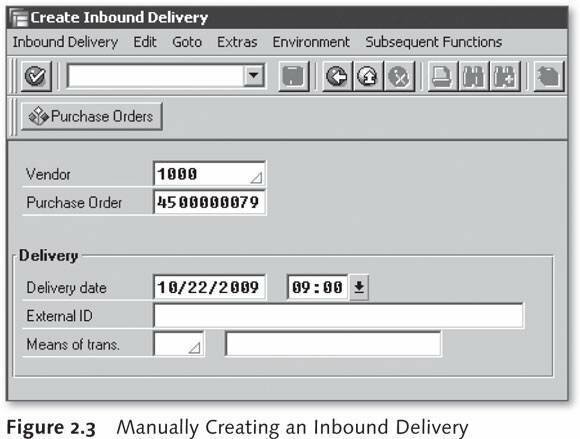 Figure 2.3 shows the manual creation of an inbound delivery for purchase order 4500000079. After you’ve entered the purchase order number and vendor number, the inbound delivery transaction will show the line item transposed from the purchase order 4500000079. Then, you just need to check the item quantity, delivery date, and time for accuracy. If the vendor has identified any specific changes, you can make these to the line item before creating the inbound delivery. Figure 2.4 shows the line item detail for the inbound delivery. After the item details have been approved, you can save the transaction, and an inbound delivery is created. An inbound delivery can be created automatically for a purchase order via EDI. The SAP system must be configured to allow the generation of an inbound delivery for an incoming shipping notification. In addition, the purchase order must be annotated with the correct confirmation information for an inbound delivery to be created. The inbound process receives an EDI document, in this case a shipping notification from a vendor. The EDI-specific headers and trailers are removed from the EDI document and it is converted into an IDoc format suitable for SAP applications. The IDoc is stored as a text file, and an inbound program reads the IDoc file and creates an IDoc so it can be processed. A posting program processes the IDoc and creates an application document, in this case a shipping notification, which is then used to create an inbound delivery. An IDoc is a document that facilitates data exchange between SAP R/3 and non-R/3 systems. An IDoc acts as intermediate storage of information, which can be sent bi-directionally. This section contains control information regarding the IDoc. It contains the name of the sender, the name of the receiver, the message type, and the IDoc type. There is always a single control record, and it is always the first record in the set. This part consists of a header that contains the identity of the IDoc. It contains a sequential segment number, a segment type description, and a field containing the actual data of the segment. There can be more than one data record. This shows the information regarding the already processed stages and remaining processing stages of the IDoc. Several status records can be attached to an IDoc. At every processing stage, a status code, date, and time stamp are assigned. You can only create the inbound delivery for a purchase order if several configuration steps have been completed. A confirmation has to have been received from the vendor, and certain configuration steps should be entered. First, the shipping notices received from vendors should be configured to allow you to create an inbound delivery. When a vendor sends a shipping notice or a confirmation, the details confirm the delivery dates and quantities of the materials entered in the scheduling agreement release or purchase order sent to the vendor. To ensure that an inbound delivery can be created from the vendor’s confirmation, you must ensure that the confirmation control key is set by going to IMG • Materials Management • Purchasing • Confirmations • Set Up Confirmation Control. 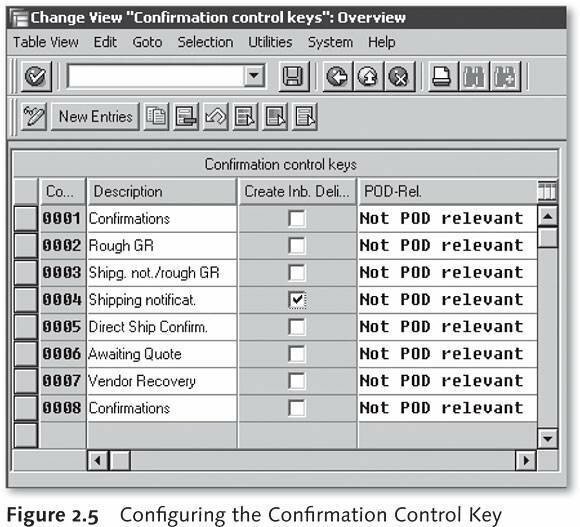 Figure 2.5 shows the configuration of the shipping notification, confirmation control key 0004, to allow an inbound delivery to be created. 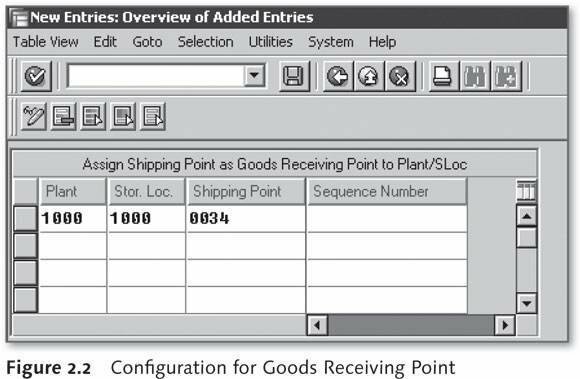 Although the configuration shown in Figure 2.5 will allow you to create inbound deliveries for a purchase order, if you want the shipment to go to a specific plant and storage location, you must take an additional configuration step. Follow the configuration menu path IMG • Logistics Execution • Shipping • Deliveries • Define Order Confirmations for Inbound Deliveries. is created for confirmations such as shipping notifications. The configuration is specific for category, order type, plant, and storage location. In Figure 2.6 the first line shows that for order type NB, which refers to a purchase order, plant 1000 and storage location 1000, an inbound delivery will automatically be created for confirmation 0004, which is a shipping notification. On the fourth line in Figure 2.6 the configuration is shown for order type UB, a stock transport order, and LP, a scheduling agreement. In this case a shipping notification can be received via EDI for plant 1003 and storage location 1002. To create an inbound delivery for a transmitted confirmation from a vendor, you must first update the purchase order with the correct confirmation key. 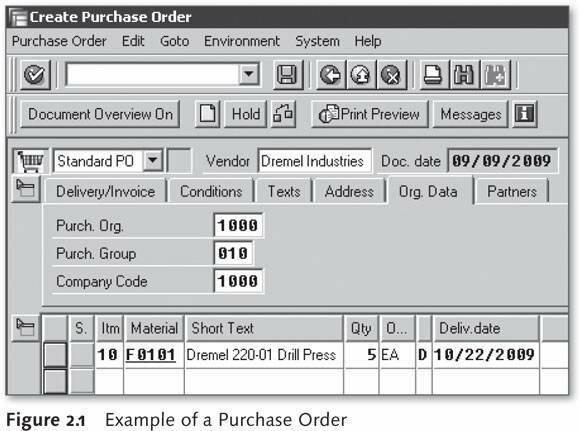 When creating a purchase order, the purchaser can add the confirmation key to the purchase order line item, as shown in Figure 2.7. The confirmation control key (Conf.Ctrl) field shows that the confirmation expected is a shipping notification, and the current status is pending, because the purchase order has not yet been created. To receive a confirmation from a vendor via EDI, you have to maintain the partner profiles of the IDoc interface for those vendors. You must fill in several fields in the partner profile. You can find the configuration using Transaction WE20 or the menu path IMG • Logistics • Materials Management • Purchasing • Messages • EDI • Set Up Partner Profile. Figure 2.8 shows the configuration for the partner profile. With inbound parameters, you specify the conditions for inbound EDI processing. Via the process code entered, you specify how the data is to be processed further in the application. You can also specify who should carry out the necessary reprocessing in the event of an error. The inbound options allow you to enter a message type that normally relates to the United Nations (UN) EDIFACT standard. 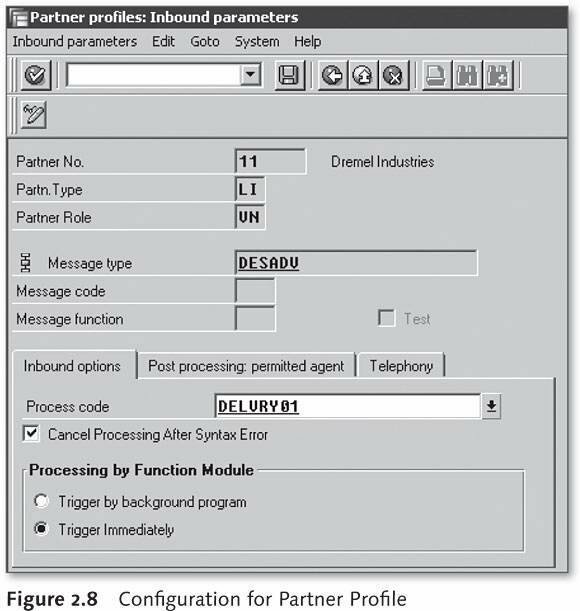 In this case the shipping notification is an inbound message from the vendor and is identified by the DESADV message type. 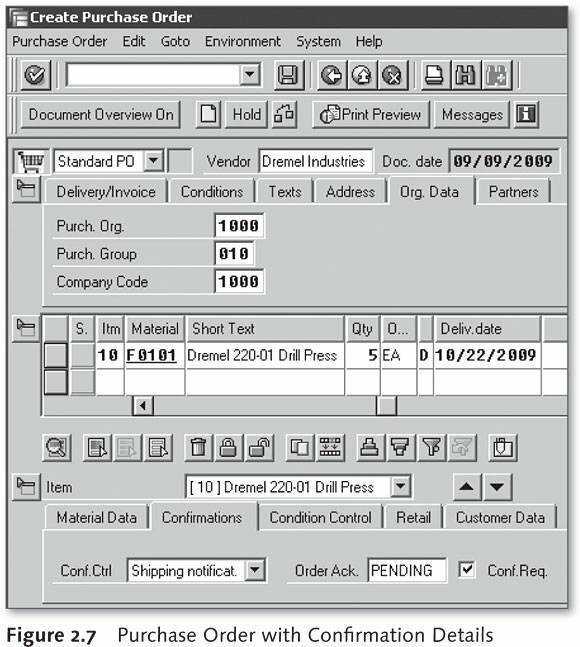 You can enter a process code that the IDoc interface uses to find the business process that controls the conversion of the IDoc into an SAP document. You can test the IDoc by using the test tool in SAP to manually generate an IDoc and send the IDoc for inbound processing. You can access the test tool via Transaction code WE19. Figure 2.9 shows the initial screen for creating a manual IDoc using the test tool. 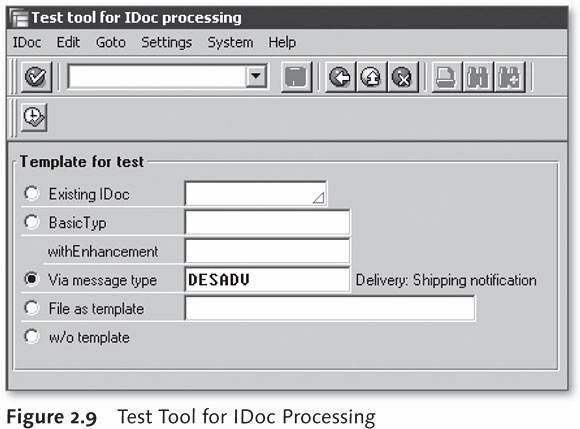 To create a manual IDoc, you enter the message type for a shipping notification, which in this case is DESADV. This may not be the message type used at your company, so check with your EDI team. The next screen (shown in Figure 2.10) in Transaction WE19 shows the fields that can be manually entered for IDocs. 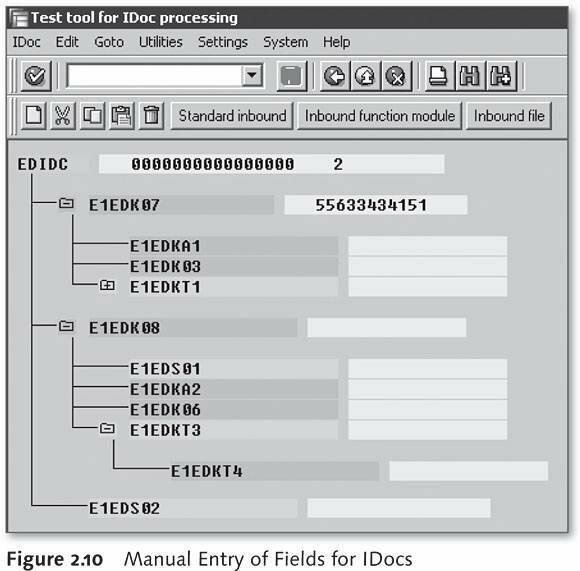 Figure 2.10 shows the fields that you can add manually to create the IDoc. When an inbound delivery arrives at the warehouse, the items can arrive in a variety of configurations. Sometimes items arrive shrink-wrapped on pallets and can moved directly into the warehouse without anyone having to break down the pallet or repack the items. This can save considerable time and warehouse resources. As part of the purchasing contract with a vendor, it may be possible for your purchasing department to negotiate that the vendor prepares the items to be automatically be placed in storage. If the items on the inbound delivery are not prepared for the warehouse, they may need to be repacked on pallets or in storage containers so they can be safely stored in the warehouse. If items are not packed correctly, damage to the items or spoilage may occur. When items are received that need to be placed in cold storage, the packaging from the vendor may only be suitable for short-term storage. In this case the items need to be repacked in containers certified for the cold storage area. Some vendors send items to a third-party shipper who combines the items on a single pallet before they arrive at your warehouse. When the inbound delivery arrives, it needs to be broken down so the items can be either repacked in a container suitable for the warehouse or combined on a pallet with the same material from other deliveries. A more detailed examination of the packing process for inbound deliveries can be found in the Section 2.2. Repacking is important when you receive returns from customers. When items are returned, they need to be separated from other items in the delivery and packed in an appropriate container so that it can be clearly identified as a return. We’ll examine the returns process in greater detail in Chapter 7. The putaway process for an inbound delivery includes the search for an appropriate storage bin in the warehouse based on the configuration of the storage type search strategy. Each item line of the inbound delivery has a putaway status that allows the warehouse supervisor to monitor the progress of the putaway. The status is set depending on what putaway process has been completed. 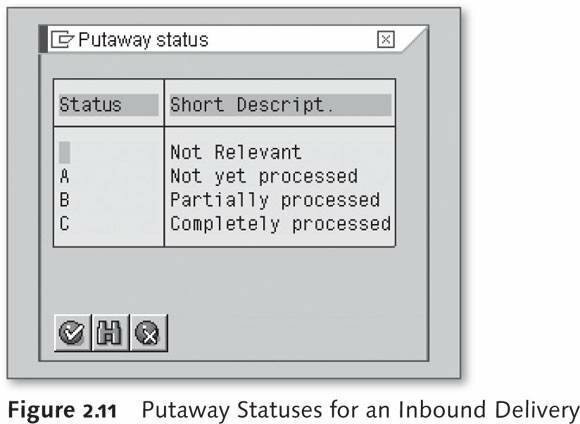 When an inbound delivery is set up for automatic putaway, the SAP system creates the transfer orders that need to be completed. The automatic putaway is determined by an output type called WMTA, which must be assigned to the inbound delivery. 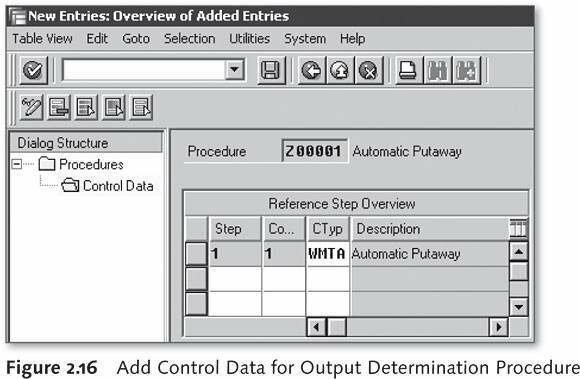 You can set up the WMTA output type in your system by following several configuration steps. 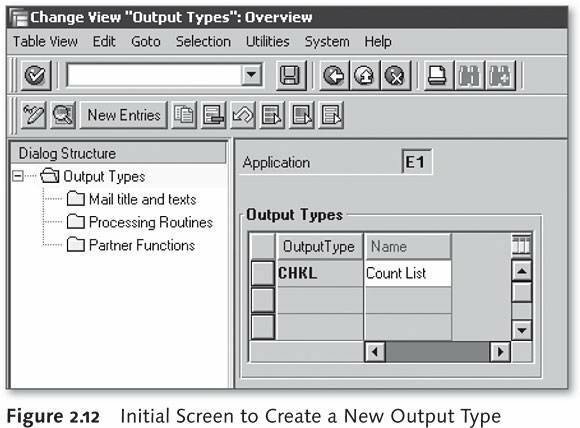 First, create the output type WMTA by following the menu path IMG • Logistics Execution • Shipping • Basic Shipping Functions • Output Control • Output Determination • Maintain Output Determination for Inbound Deliveries • Define Output Types for Inbound Delivery. This transaction allows you to enter the new output type, WMTA. On the initial screen click on the New Entries button, shown in Figure 2.12. The new entry is for the output type WMTA. The data required for this output type should be assigned to access sequence 0001. You add this new data on the General data tab, as shown in Figure 2.13. The output type requires that two fields are selected: one to allow access to the conditions and the other to define partner-independent output. After you enter this data, the next step is to access the processing routines. 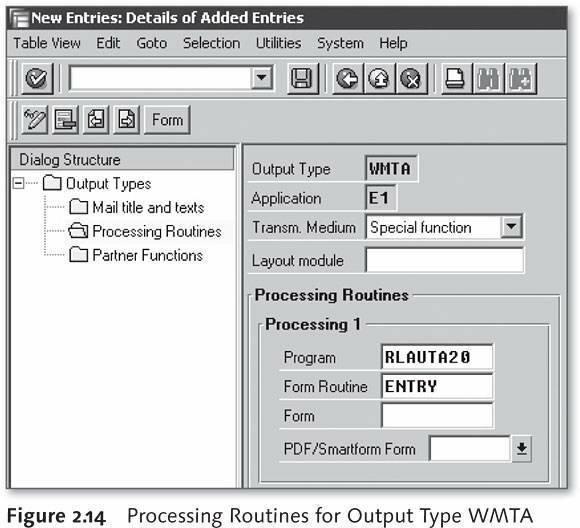 Figure 2.14 shows the configuration for the processing routine for output type WMTA. Select Special function in the Transm. Medium field and assign program RLAUTA20. After you’ve entered all of the configuration for WMTA, save the output type. The next step of the configuration is to add the output type to a procedure. To maintain the output determination procedures, follow the navigation menu IMG • Logistics Execution • Shipping • Basic Shipping Functions • Output Control • Output Determination • Maintain Output Determination for Inbound Deliveries • Define Output Types for Inbound Delivery. The standard SAP output determination procedure is E00001. If you want to create a new procedure, use the data standards in place at your company. In this case we’ve created a new procedure called Z00001, shown in Figure 2.15. The usage field determines for which area the condition is used, in this case B for output conditions. The application field further breaks down the condition. In this instance, E1 refers to the inbound delivery , so the procedure (Z00001) we’re adding is for inbound delivery output. The next step is to enter the control data for the new procedure. Select your new procedure and click on the Control Data tab in the dialog structure. 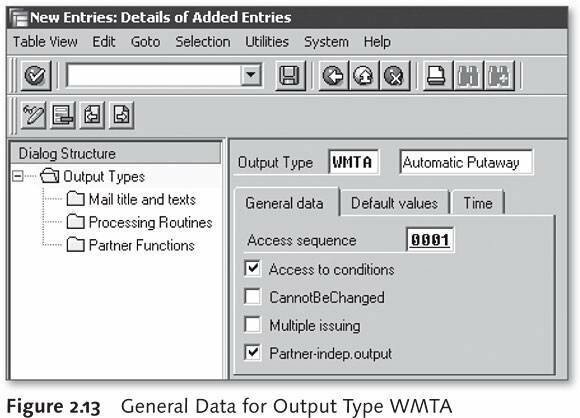 Figure 2.16 shows the one entry for the procedure that is the output type WMTA. After entering the output type into the procedure, save it and then assigned it to the delivery type. To complete this task, you can either use Transaction VNE7 or follow the menu path IMG • Logistics Execution • Shipping • Basic Shipping Functions • Output Control • Output Determination • Maintain Output Determination for Inbound Deliveries • Assign Output Determination Procedures. 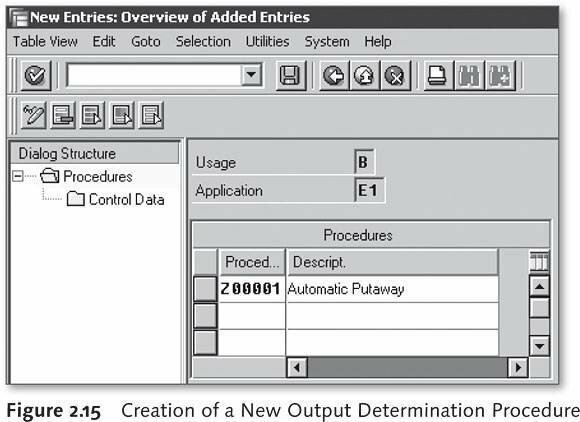 Figure 2.17 shows final configuration step, where the inbound delivery type, EL, is linked to the new output determination procedure, Z00001, and the output type WMTA. This pulls in the Z00001 procedure for each inbound delivery. 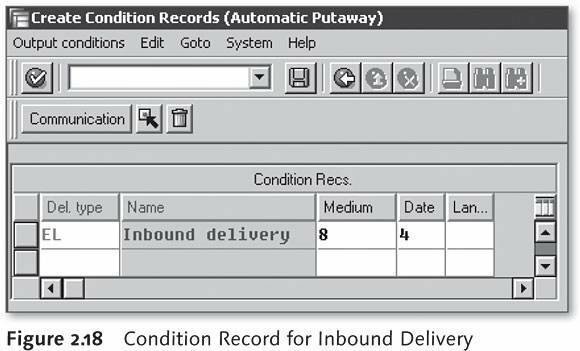 After you complete the configuration, you must create the condition records for the inbound delivery. You can use Transaction MN24 to enter the condition records or go to SAP • Logistics • Materials Management • Purchasing • Master Data • Messages • Inbound Delivery • Create. 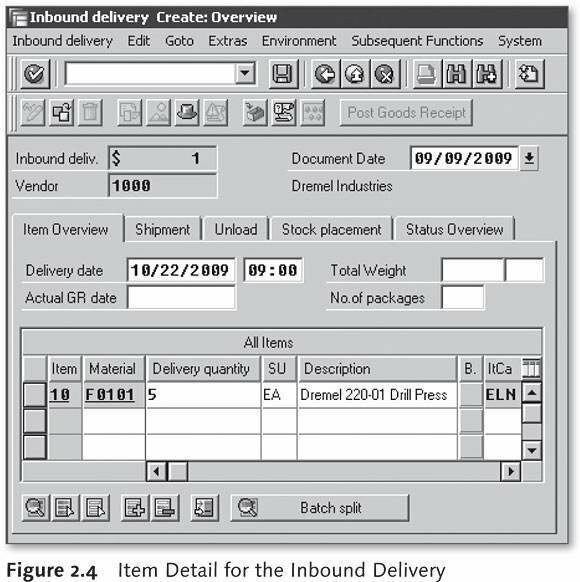 Figure 2.18 shows the condition record for the inbound delivery. The delivery type entered is EL, which represents the inbound delivery. The other information required for the condition record is the message transmission medium, which should be entered as a special function represented by the number 8. You use this because no output is being created; in this case the system automatically creates transfer orders for the items on the inbound delivery. The other field you need to fill in on the inbound delivery condition record, shown in Figure 2.18, is the date or dispatch time field. For the inbound delivery the output should be created immediately, represented by the number 4.